Thanks to a growing group of dedicated volunteers, we now have good data on the number of roding Woodcock for over 150 sites across 24 counties since 2003. Fig 1 - Annual change in the relative abundance of Woodcock based on counts of roding males. It is possible that weather has an influence on annual fluctuations in Woodcock numbers. Given the general declining trend, which may invovle factors in addition to weather, it is essential that we continue to count atleast 100 sites per year in order to more closely monitor future change. Please do consider re-surveying your 2013 survey site or an new site this summer. 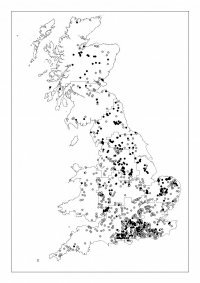 Thanks to the help of our volunteers, over 800 randomly selected sites were surveyed in 2013, which has resulted in two papers being published using the data collected. Site occupancy declined by 19%, since 2003. 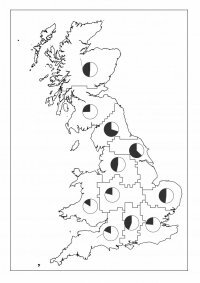 At large landscape scales, breeding abundance was correlated with total woodland area and woodland type. Woodcock were more abundant in woods containing a varied mix of woodland habitat types and in woods further from urban areas. On a smaller spatial scale, Woodcock were less likely to be found at sites dominated by Beech and more likely to occur in woods containing Birch. (shaded = present, white = absent).